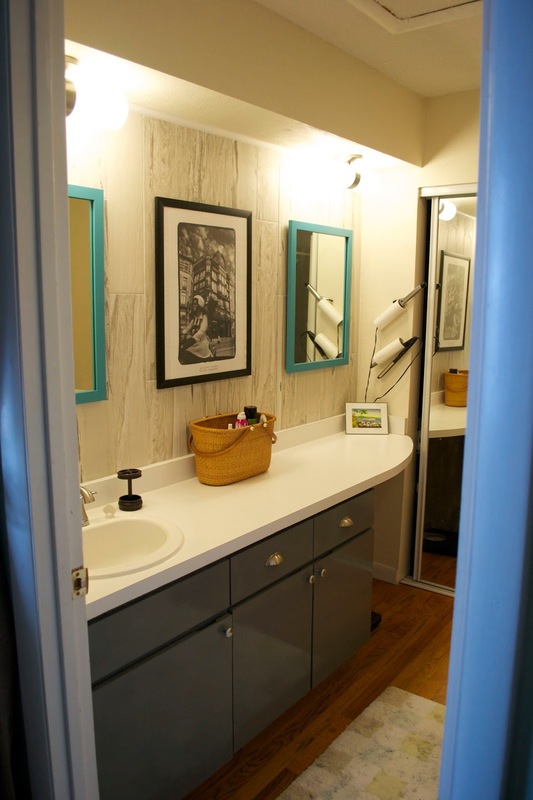 We're still on the master bath today. For some reason, someone really liked these huge (ugly) fluorescent lights since they were in multiple spots in the house. The one in the Master bath was the only survivor... until a couple of weeks ago. These lights are generally held up with a few screws so I popped it off in the hopes that the light box would be in a good spot to put a new light over the sink. Instead, I found no light box at all. They just drilled a hole through the drywall and stuck the wires through... bad contractor. 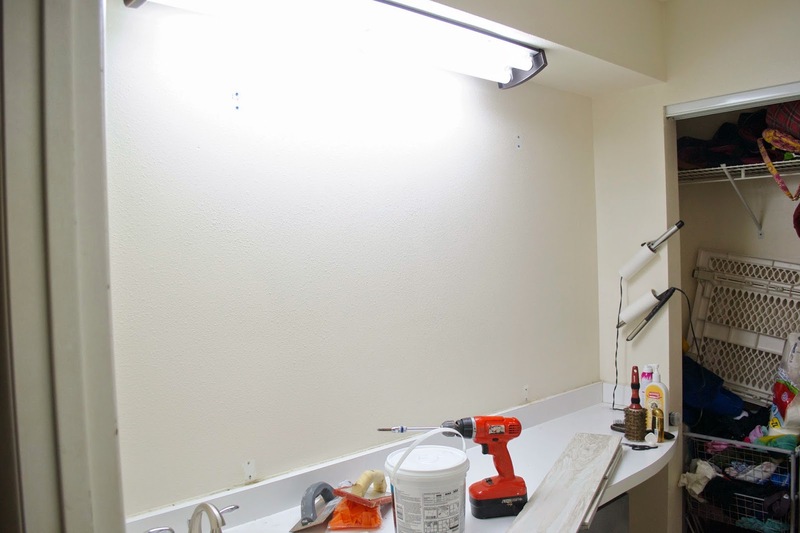 The good news was that the hole was directly above the sink so Nate drilled out a new, larger, hole so that we could install a retrofit light box (link to similar one we used) and properly install new lights. Since we were replacing a huge light with a much smaller one, we decided to add another light above the second mirror. This required drilling a second hole, another light box and running a new wire from the old light to the new one. 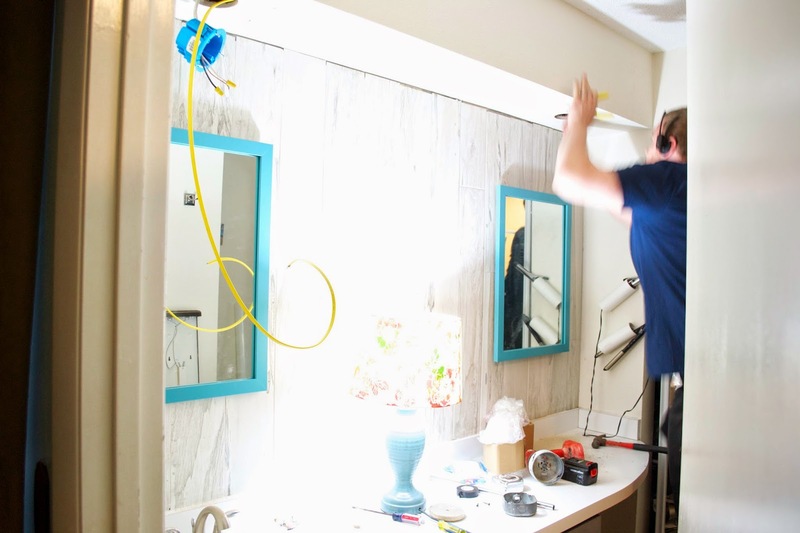 Since most lights, especially vanity lights, are meant to be installed on a vertical wall, it took some hunting to find lights that would work being installed on the ceiling. 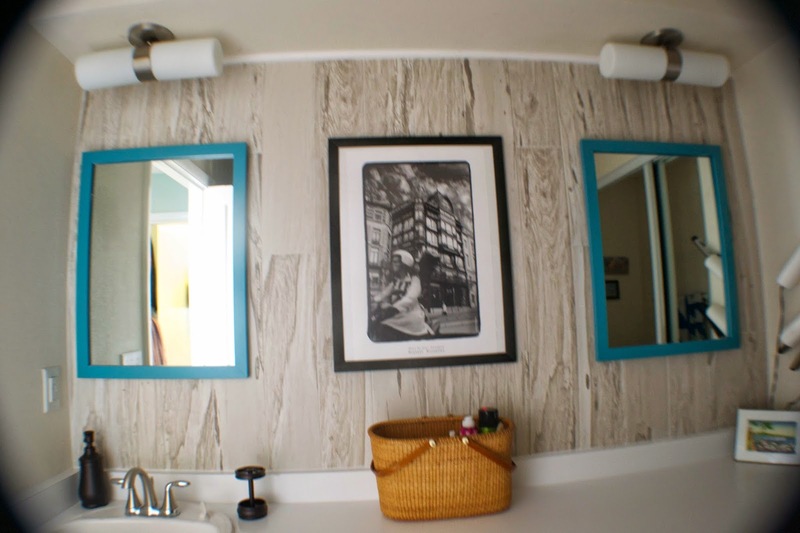 I liked the modern look of the ones in this remodel but all version similar that I found were over $100 a piece. I finally found similar ones at Lowe's by Style Selections that were close enough for our purposes. At $35/piece they were perfect for a bathroom getting a quick facelift. Nate installed the new lights and the lighting is sooo much better. We did have a slight issue with a Lowe's sales person refusing to sell him soft white bulbs because it would ruin Will's eyesight (he literally had them all hidden) but after talking to a manager we got our soft white light. It's so nice not having a ton of harsh light in this small room. If you want to see everything else we did in this room, follow the links below!